Each summer awesome FTE alumni join our staff to work as Program Coordinators (PCs) and this summer is no different! If you are a participant in one of our summer programs this year then you will get know your PCs very well. One of those all-star coordinators is Mikayla Angel. Mikayla started working with FTE in the Summer of 2018. In 2016, she attended Economics for Leaders at the University of Florida. When she’s not running leadership activities, she can be found in Philadelphia where she attends the Wharton School of Business at the University of Pennsylvania. 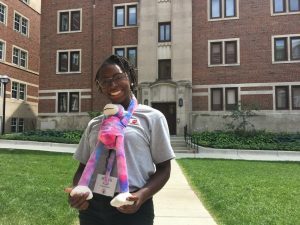 Mikayla is very active on the Penn campus, involved in Girl Scouts, Women’s Rugby Football Club, Black Wharton Undergraduate Association, president of Table Talk and employed with the Annenberg Center for Performing Arts. She is also extremely active in her district’s Young People and Children’s division which helps youth grow in Christ and be social justice advocates! This summer you can find Mikayla at the University of California, Santa Barbara, July 29 – August 4. She is looking forward to meeting other new PCs, working in a new location and learning about herself through the process of teaching others. We look forward to having Mikayla on our team again this summer.